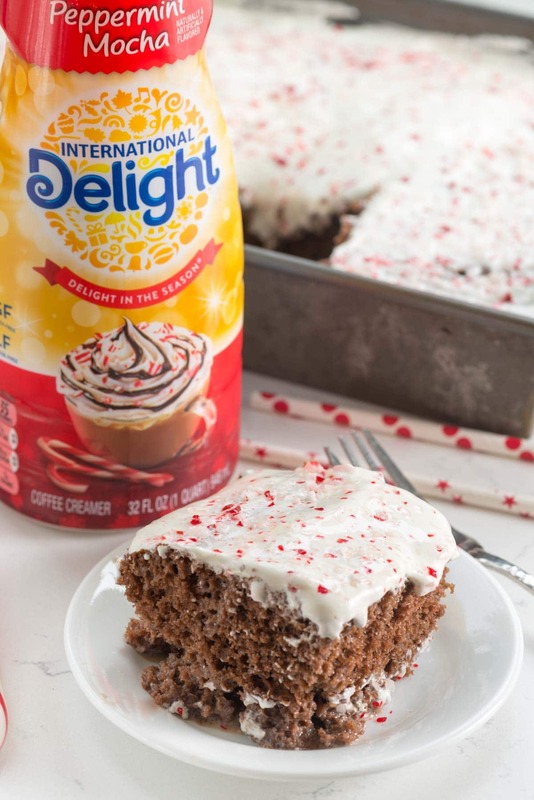 Peppermint Mocha Tres Leches Cake – this easy chocolate cake recipe is drenched in peppermint mocha and chocolate milk flavor! Friday night – Jordan had a friend sleepover. Saturday morning – friend went home, Jordan couldn’t find her iPod (actually an old phone but it only works on wifi). We looked around, but it was dead so we couldn’t ping it. No worries, we’ll find it later, we had errands to run! Saturday night – Hmmm….where is the phone? She last had it on her bed…it’s not there. OMG what the heck is all that under her bed? *head exploding* I’ll look on Sunday. Sunday lunchtime – spend an hour looking everywhere in the house. Sunday afternoon – Oh, we found it…in her friends’ overnight bag. Silver lining: Jordan’s room is clean. I now have a reminder on my phone to look in all her secret spots once a week and if I don’t like what I see I’m gonna pause her internet. In the meantime, I’m just so glad we finally found it! By Sunday night was ready for a GINORMOUS glass of Peppermint Mocha Snugglers and a huge slice of this Peppermint Mocha Tres Leches Cake. 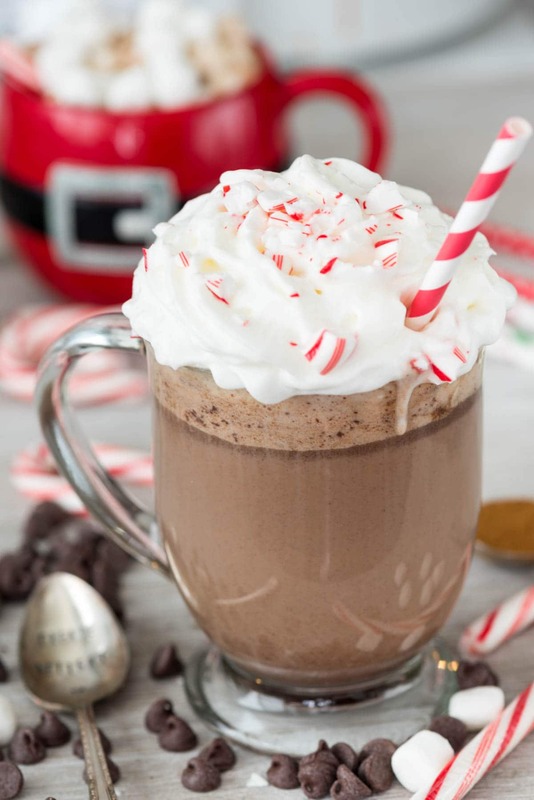 Nothing says Christmastime like peppermint mocha, right? Peppermint Mocha Tres Leches Cake is absolutely SOAKED with peppermint mocha flavor. BTW…what’s the difference between a poke cake and tres leches? I’m really not sure. It’s in the cake AND it’s in the tres leches. If you love that classic Christmas flavor, this cake is for you. I started with a cake mix and instead of adding water I used International Delight Peppermint Mocha creamer. That makes the cake taste all pepperminty and chocolatey just by itself. You could even stop right there and just frost it and it would be amazing, but really don’t stop there. Add the tres leches sauce, PLEASE. The sauce is a combination of sweetened condensed milk, chocolate milk, and more creamer. Really, I could drink it with a straw, but it also tastes good poured allllll over cake. Once it soaks in (the longer the better!) 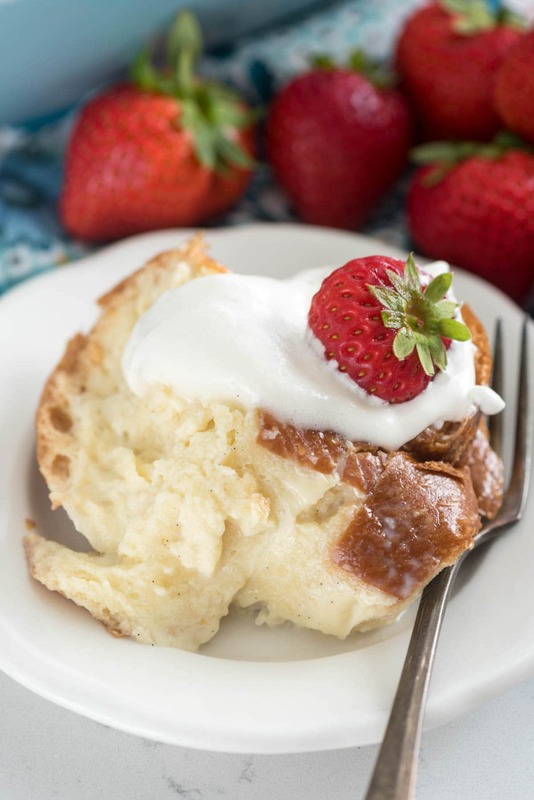 you frost the cake with whipped cream or Cool Whip and serve. Who says plain old tres leches cake gets all the fun? This Peppermint Mocha Tres Leches Cake is top notch guys…I promise. 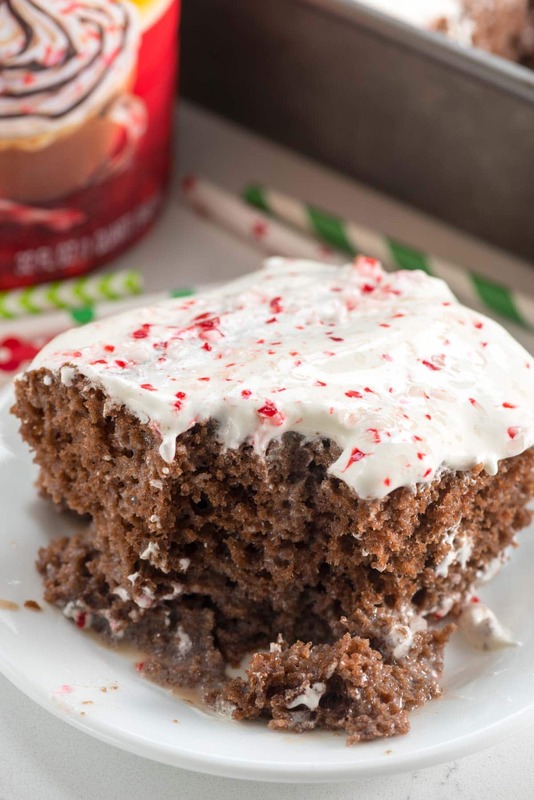 Brainstorm: I gotta try making this Peppermint Mocha Tres Leches Cake recipe with eggnog, too!! Peppermint Mocha Tres Leches Cake - this easy chocolate cake recipe is drenched in peppermint mocha and chocolate milk flavor! Preheat oven to 350°F. Spray a 9x13" pan with nonstick cooking spray. Use the kind with flour, if you have it. Whisk (or mix using a hand mixer) the cake mix, eggs, oil, and 1 1/4 cups of creamer until smooth (a couple of minutes). Pour into prepared pan and bake for 30-35 minutes, or until a toothpick comes out clean. Let the cake cool for 10 minutes. Mix the sweetened condensed milk, chocolate milk, and remaining 1 cup of creamer in a large measuring cup. Use a toothpick to poke several holes all over the top of the slightly cooled cake, then pour the tres leches mixture all over the top. Let it cool completely before frosting and serving. The longer it soaks the better (you can make it the day before, store covered in the refrigerator). Awesome recipe! Glad the lost phone was found. Like you said, at least the room is now clean! what’s the difference between a poke cake and tres leches? <— Poke cakes for me are with a sweetened cond milk + caramel sauce or SCM + chocolate syrup that are then poked in. Whereas with tres leches you're using 3 milks and just 3 milks, rather than the caramel/syrups, etc. But when I was making my scratch tres leches last spring, I remember writing that I feel like tres leches cakes were the original poke cakes. Not sure if you really wanted a full answer to that but that's my .02 only of course! Glad you found the phone. And I hope you ate a ton of this cake after that debacle bc it looks amazing! You are soooo creative! LOL, the phone thing… gotta love kids. I’d end that night with a giant slab of this (and of course some wine to wash it down??). Truly though, this looks so good! I’m so glad you guys found it! But scary under the bed escapades…yikes. haha! One time my sister in law lost her keys for like 5 days and they ordered a new one….it was in her purse. new tres leches flavors!!! love this, so fun Dorothy!! I’m crazy for Tres Leches!! This holiday twist with pepper mint is making me droo(o)l. Must try for me! Im a big fan of Tres Leches cakes, I love the creativity on this one with peppermint, looks yummy! We got invited to what was an untraditional Xmas dinner for us. They were having Enchiladas, and a taco bar. That’s cool. We love enchiladas and tacos. I was responsible for bringing the dessert, and although I wanted something holiday-ish, I also wanted to stay with the theme. In comes Peppermint Mocha Tres Leches Poke cake. I immediately thought, What a beautiful mash up, and I went for it. Little did I know that 1/2 the family was gluten and dairy free, but out of the half that was not, MOST enjoyed it. One asked, “What did you put in here to make it so moist?” She nodded her head as I gave her the answer, and then politely threw it away after a couple of bites. Maybe she was full, who knows!? 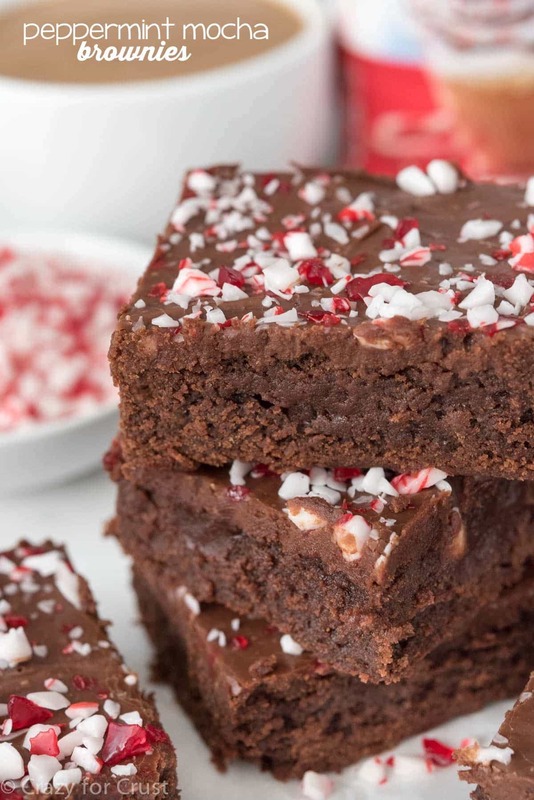 🙂 There were a couple who went back for seconds, and one who said, she would try making it with a gluten free cake mix, and milk substitutes, but she was excited that she could use the peppermint mocha creamer. Thanks for a perfect mash up for me to take to Xmas dinner.